The Albaseerah Blog | Calling to Islam in Bradford upon the Salafi Manhaj: Albaseerah Podcasts now LIVE! 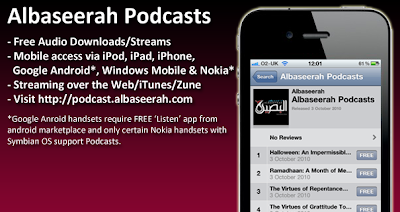 Selected Audio lectures from Albaseerah available for FREE to stream or download as Podcasts via the Web or Mobile! Any HTML5 Browser (Internet Explorer 9/Google Chrome/Safari/Opera/Firefox 4) via http://podcast.albaseerah.com. All available podcasts will now be available for you to download and/or stream. Download the FREE 'Listen' app from Android MarketPlace. This Post will be updated on further instructions insha'Allaah.